In Portugal, there are two different types of toll motorways: those which use a system of electronic toll collection and those with traditional tollbooths. The best way to pay the tolls on both types of motorways is with an electronic tag. The electronic toll collection system identifies vehicles as they pass under gantries (or pórticos, as they are called in Portuguese) erected over the carriageway. How does it work? The electronic collecting points are fitted with cameras and laser sensors. What you need to remember. What you need to remember when using electronic toll roads. * Class 5 refers only to motorcycles with electronic device. *Class 5 refers only to motorcycles with electronic device. * A24' road concessionaire is NorScut, however the toll charging system is managed by Ascendi. ** Class 5 refers only to motorcycles with electronic device. 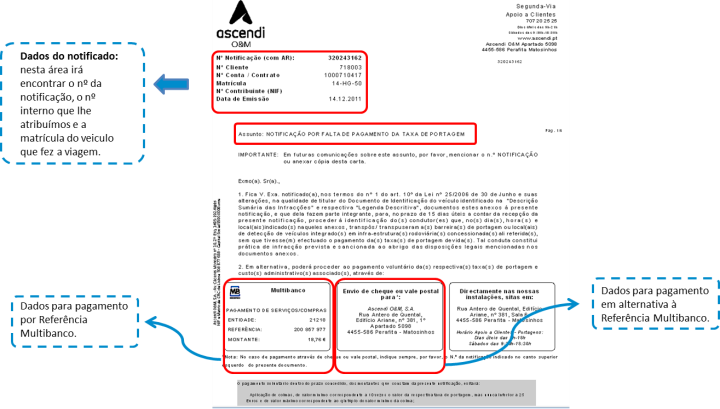 *General operation of Túnel do Marão is a responsability of IP – Infraestruturas de Portugal, however the tolls managed by Ascendi. When a vehicle passes under a collecting point, the system checks if it has a valid tag, takes a photograph of its licence plates (front and rear) and identifies the class by verifying its dimensions. If a vehicle does not have a valid tag, our system analyses each photograph and reads the licence plates. If necessary, (see payment methods here),we consult the vehicle registration records so that we can identify the owner and notify them to pay. The identification system that we use is certified by the competent body (IMT – Instituto da Mobilidade e dos Transportes, I. P.) and the results are properly verified. The best way to pay tolls on roads where only electronic toll collection is available is by means of an electronic tag. When you are driving on the motorway, your vehicle is identified automatically and payment is made by debiting your bank account (Via Verde automatic payment) or by deducting the applicable amount from the credit on your pre-paid electronic tag (Via Verde pre-payment). With an electronic tag, you pay only the tolls; you avoid all additional charges as well as the inconvenience of having to go to a CTT post office or PayShop to pay. You can buy your electronic tag at our facility in Matosinhos. If you prefer, you can purchase it online on Via Verde. Discounts are available for goods transport vehicles. Click here for details on how to apply for. See below for full details on how you can pay for your electronic tag. Via Verde: Journeys are debited against the bank account associated with the tag. For more information about the modalities available and their prices, click here. Pre-Paid CTT: The identified owner of the vehicle pre-pays a certain amount. Applicable tolls are deducted from the pre-paid amount until it is exhausted. For more information about this product and its price, click here. If the pre-paid account is cancelled, any remaining credit is refunded to the account holder. Click here to see jouney records for customers with CTT tags. Pre-Paid CTT Anonymous: Under this system, the user of the vehicle purchases a temporary tag and sets pre-paid credit on it anonymously. If the pre-paid account is cancelled, remaining credit is not refunded to the account holder and becomes the property of Infraestruturas de Portugal, SA. If you travel on a motorway which only has electronic toll collection and you don't have a tag, you will have to pay at a CTT post office or at a PayShop agent. To find out when you have to pay, see the table on the side. When you pay your tolls at the post office or at a PayShop agent, you pay an extra €0.32 for each journey (up to a maximum of €2.56 per payment). These additional charges are applied according to the Portuguese Law (Portaria no. 314-B/2010). When you pay your tolls at the post office, you can ask for your receipt to include detailed information about the journeys done with your vehicle. All you need to take with you are the vehicle's identification documents, to prove that it is yours. Click here to find out if you have outstanding journeys to pay, how much you owe and when you have to pay it by. Click here to find your nearest CTT post office and its opening times. Click here to find your nearest PayShop agent. For information about paying at PayShop agents, click here. If you have not paid by the deadline, we will start proceedings to obtain payment of the amount you owe. As the first step in the process, we will send you a payment notification, which will show the amount owed and the applicable additional charges (€2.21 per journey). We will send this notification to the person and address shown on the vehicle's registration record. If you still do not pay after receiving the payment notification, the process will be submitted to the Customs and Tax Authority (Autoridade Tributária e Aduaneira – AT), which will result in a fine as part of enforcement proceedings (ultimately, this could lead to seizure of your assets). On electronic toll roads, you will find inspectors whose job it is to ensure that tolls are paid. They are there to help you and you can ask them any questions you may have about the electronic tolls and even pay your notifications. If you still have questions, you may be able to find the answer in our FAQ section here. For those driving a vehicle with a foreign license plate, there are various options available for paying tolls on roads where only electronic toll collection is available. Via Verde is the best option if you have moved to Portugal permanently - You can buy a Via Verde electronic tag. With the Via Verde system, payment is made by debiting your bank account (Via Verde automatic payment) or is deducted from the credit on your pre-paid electronic tag (Via Verde pre-payment). When you use Via Verde, you only pay the toll charges. If your vehicle has a Spanish licence plate, you can buy the tag in Spain and use it both in Spain and Portugal. In Portugal, you can buy your electronic tag at our facilities in Matosinhos. you don't have to go to the post office or PayShop to pay. in Portugal, call 210 730 300. The lines are open from 8.30 am to 8.30 pm on business days. from abroad, call 00 351 21 000 80 65. The lines are open from 8.30 am to 8.30 pm (WET). The Via Verde Visitors system was designed especially for frequent visitors. If you often use Portuguese motorways, you can hire a temporary Via Verde Visitors tag and associate it with a credit card. With the Via Verde Visitors system, the tolls are automatically debited against your bank account. from abroad, call 00 351 21 000 80. The lines are open from 8.30 am to 8.30 pm (WET). EASYToll is the perfect solution for stays of up to one month. This system lets you associate your vehicle's licence plate with a credit card (MasterCard or Visa) for a period of up to one month. Whenever you pass through an electronic toll arch, your licence plate is photographed and the toll charge is debited against your bank account. More information is available online at www.portugaltolls.com. This system lets you associate your vehicle's licence plate with a pre-paid card containing credit of €5, €10, €20 or €40. Whenever you pass through an electronic toll gantry, your licence plate is photographed and the toll charge is deducted from the credit on your card. Virtual Pre-payment is for occasional travellers. This service is ideal for occasional travellers. With this system, you don't need an electronic tag. When you go through a toll gantry, the camera will photograph your licence plate. Virtual Pre-payment can be used for three days with no limit on the number of journeys. It is valid for vehicle classes 1, 2, and 5. You can obtain this service from our inspectors (see how to recognise them here). More information is available at / CTT post offices or online at portagens.ctt.pt. If you are travelling in a car with a foreign licence plate on a road which only has electronic toll collection and you do not choose one of the options mentioned, we will get in touch with you to collect payment. In this case, you will have to pay additional costs. Choosing in advance will save you money and allow you to travel worry-free. Click here to check which highways have this toll system. The best way to pay is with an electronic tag. With an electronic tag, you pay only the tolls; you avoid all additional charges as well as the inconvenience of having to go to a CTT post office or PayShop to pay. You can buy your electronic tag facilities in Matosinhos. or online on the Via Verde website Via Verde. If you travel without an electronic tag, you will have to pay at a CTT post office or at a PayShop agent. You pay an additional charge of €0.32 per journey (up to a maximum of €2.56 per payment). If you don't pay at a post office or PayShop agent, we will send you a payment notification, which includes an additional charge of €2.21 per journey. We will send this notification to the person and address shown on the vehicle's registration record. If you still do not pay after receiving the payment notification, the process will be submitted to the Customs and Tax Authority (Autoridade Tributária e Aduaneira – AT) and you will be fined. If your vehicle has foreign licence plates, you must opt for one of the payment systems specifically designed for foreign-registered vehicles. You will find a team of inspectors on roads with electronic tolls. They are there to help you and you can approach them to ask any questions you may have about the electronic tolls and even pay your notifications.